Florence Parly, the Armed Forces Minister, revealed on Monday, June 11, during the inauguration of Eurosatory 2018, that the Army’s future Véhicule Blindé Multi-Rôles Léger (light multi-role armored vehicle, VBMR) will now be called SERVAL. The name SERVAL -- a small desert wildcat -- is in line with the designations of the other vehicles of the SCORPION program (Griffon and Jaguar). It also refers to the French operation launched in Mali in January 2013, and evokes French audacity, the heroism of our soldiers and honors the memory of our dead. In addition to the Griffon, SERVAL is intended to equip combat units in the forward contact zone. SERVAL combines agility, strategic mobility and large payload capacity. It is intended to equip troops in all operational functions and in particular the Quick Reaction Force (QRF) at the national emergency force. It will be declined in several versions. This is the third vehicle developed under the SCORPION program. 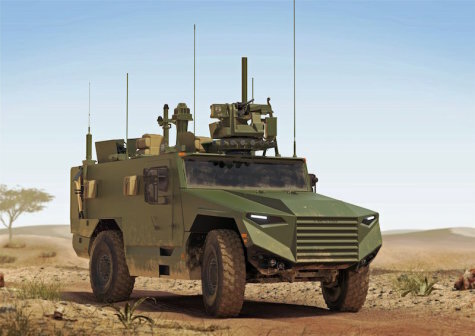 This vehicle is developed by Nexter and Texelis as co-prime contractors. The first army regiment should be equipped with SERVAL by the end of 2022. The 2019-2025 Military Program Law (LPM) provides for a reinforcement of the program with orders for more than 600 additional armored vehicles, the first of which will be delivered by the end of 2018. Over the LPM’s duration, nearly 1,700 Scorpion armored vehicles will be delivered: 933 Griffon, 150 Jaguar, 489 VBMR light multi-role armored vehicles (SERVAL) and 122 modernized Leclerc tanks. This accelerated modernization (half of the new medium-weight armored vehicles will have been delivered by 2025) will also be marked by the deployment of the SICS, the information system that will network all platforms of the Scorpion program, completing the Army’s evolution for the digital era.